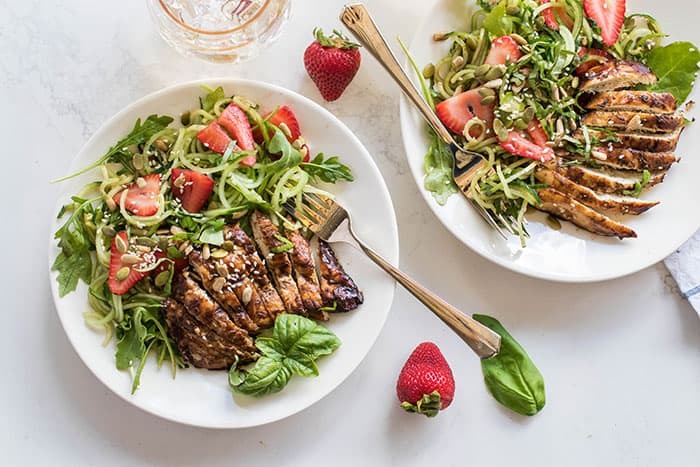 This Grilled Balsamic Chicken with Strawberry Cucumber Salad is such an easy, refreshing, and healthy summer meal. Perfect for hot days when you can’t imagine cooking indoors! Follow along the next month for lots of healthy grilling recipes. I had so much fun brainstorming ideas for my last series– freezer friendly meals— I thought it only appropriate to dive into a new series for my favorite style of cooking– outdoor grilling! I started off this series with what has turned out to be my most popular recipe this year, a beautiful Grilled Peach and Vegetable Pesto Pasta. If you’re looking for some healthy meatless meals for the summer, check that one out! I am in love with summer, every part of it. I love the warm weather, of course, but it goes further than that. The longer days just seem to add hours, and everything feels less rushed and more lighthearted. Maybe it’s because I really prefer iced coffee to hot (of course this has to be part of it, because coffee is VERY important). Or maybe it’s because I love hiking and being on the river and picnicking at the park. Having lots of family coming through town, getting together for parties or BBQs, is certainly a bit part of my adoration. And another thing that is absolutely a part of it? Light summery salads and grilled meats, like in this dish. Hand me a burger and a salad like this, and I’ll choose the salad any day. I highly recommend NOT skipping the basil here! I’ve planted two basil plants this summer, just so I always have it on hand for Pistachio Herb Pesto and to add flavor and dimension to otherwise incredibly simple salads. I use my OXO Spiralizer for fun, noodle-like veggie shreds. You can also use a veggie peeler (similar to how I did the zucchini in this Artichoke Millet Power Salad). Chicken breasts can really dry out on the grill. I simply don’t grill them unless I’ve marinated them. This marinade is delicious after only 2 hours, but even better if left overnight! If you’re looking for an indoor version of this recipe, look at how I cook Balsamic Chicken here. 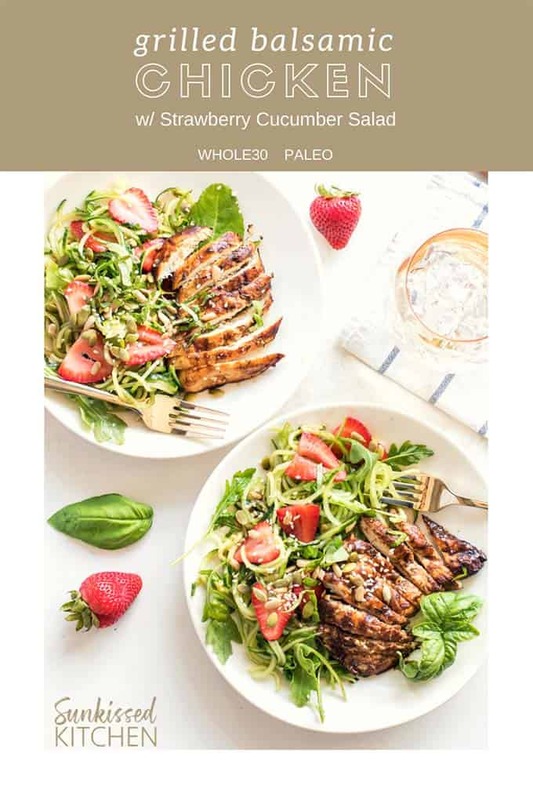 Make it Paleo/Whole30: This recipe will certainly have you excited for your next Whole30 meal! The only modification that needs to be made is to skip the tablespoon of honey in the marinade. I’ve tried this, and it’s fine – the honey makes the coating of the chicken a bit stickier (which is delicious! ), but flavor wise, it’s not necessary! Switch it Up: I am not a pork person, but I imagine pork chops would be equally delicious in this marinade. You can also swap your summer fruit– peaches, blueberries, or raspberries would all be amazing! Add chicken and all marinade ingredients to a plastic bag or sealed container, and allow to sit in the refrigerator for 2 hours up to overnight. 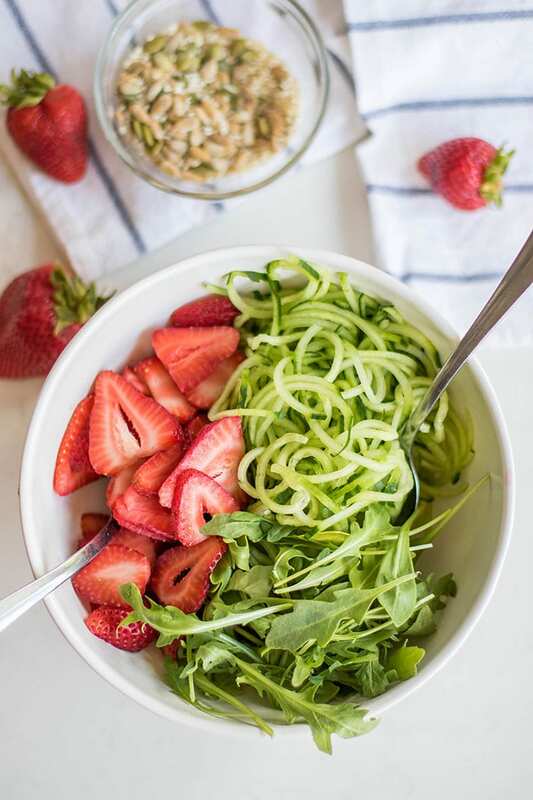 Prepare salad by spiralizing cucumbers, and combining the cucumber noodles with the arugula and sliced strawberries in a bowl. Drizzle the salad with olive oil, balsamic and lemon juice, and toss to coat the salad. Grill the chicken until cooked throughout. Serve the salad garnished with basil and seeds. Love these refreshing textures, colours and flavours plus you've reminded me that I have an Oxo spiralizer that I really need to get into use more! Camilla, get out your spiralizer! I have lots of salads on my blog with recipes for spiralized zucchini, cucumber, sweet potato and butternut squash :) I just love how changing the texture makes it like eating a different vegetable. Such gorgeous photos! I love the styling, especially the spiraled cucumbers. Definitely perfect for summer. Thanks Tara, I loved how these turned out. The cucumber noodles are so refreshing and fun! This recipe just SCREAMS summer and I love how you spiraled the cucumbers for the salad. So creative. I also wanted to tell you that your photos are STUNNING! I am going to put this on my summer grilling list for sure! Thanks so much for sharing. Thanks Mandee :) I hope you enjoy this! 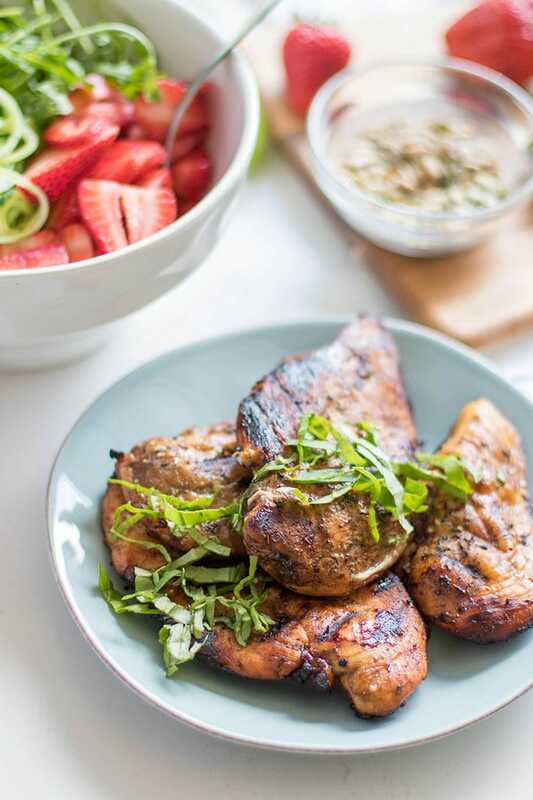 We just grilled more balsamic chicken today-- such a simple and flavorful marinade. 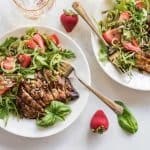 I love balsamic chicken and this recipe looks amazing! I am definitely going to give this one a try! Thank you for sharing! Luci’s Morsels | fashion. food. frivolity. Thanks Luci! It turned out so delicious I had to share it. We've been making it for 2 months now! This is such a beautiful looking dish. 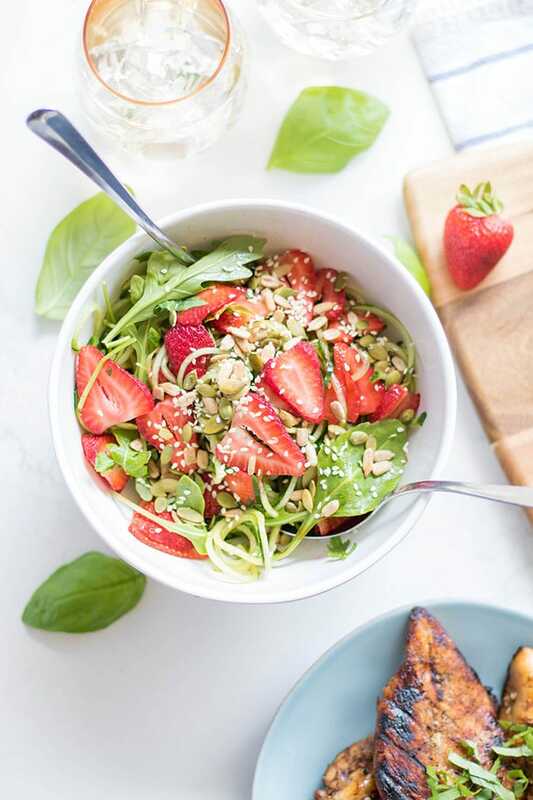 I love using strawberries in savoury dishes. Yay for strawberry season. That looks so good! I LOVE balsamic! This reminds me of one of my favorite chicken recipes for the slow cooker that is cooking in balsamic...but grilled? That must be amazing with the smokiness! I'm a huge balsamic fan, too! I love cooking chicken in a fry pan with it, so I thought I would see if marinating it would work in a grilling recipe-- and it does! :) So, so well. Thanks for the pin, Theresa! Your pictures look stunning, and this salad sounds totally delicious. Perfect summer eating. This salad was totally delicious! The cucumber noodles are so refreshing-- a summertime favorite! And, thank you! I loved how these photos turned out as well. Wow, I could have never figured out such an stunning recipe on my own! I definitely need to try this one, though I'm sure my wife will love it much more than me! 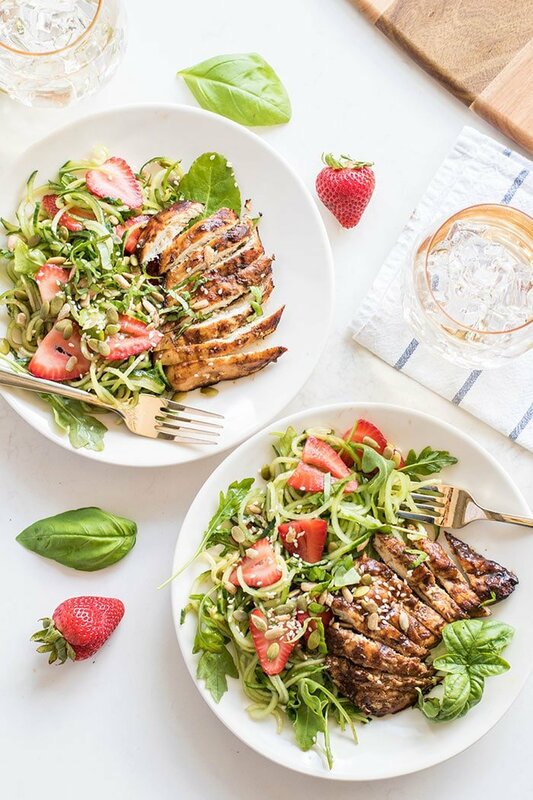 It's a really delicious one-- the Grilled Balsamic Chicken is so easy, and so flavorful.